The pug is a jovial dog with a round and wrinkly head, a short nose, a stout and sturdy little body and a curly tail. This adorable small dog is charming, good-natured, energetic, and playful. The pug is a little dog with a big personality, so it is ideal for those who want a compact but active companion dog. The even-tempered demeanor of this breed makes it a good choice for families with children. The pug is one of the world's oldest breeds of dogs, with a history dating back to at least 400 B.C. There is much debate over the true origins of the pug, but it is generally believed that the breed originally came from China. The pug may be related to the Pekingese, though some believe the breed descended from the bulldog or mastiff. Pugs were once companions to Buddhist monks in Tibet, which may explain why they are such loving, upbeat creatures. In the 16th and 17th centuries, pugs became popular among European royalty. They were brought by King William II and Queen Mary II from the Netherlands when they ascended the throne of England. They appear in paintings made by Goya of Spanish nobles. Napoleon's wife, Josephine, had a pug that carried secret messages to Napoleon in prison. Queen Victoria had pugs, as did her descendants, King George V and King Edward VIII. A new wave of pugs and Pekingese were brought back to England after the British overran the Chinese Imperial Palace in 1860. 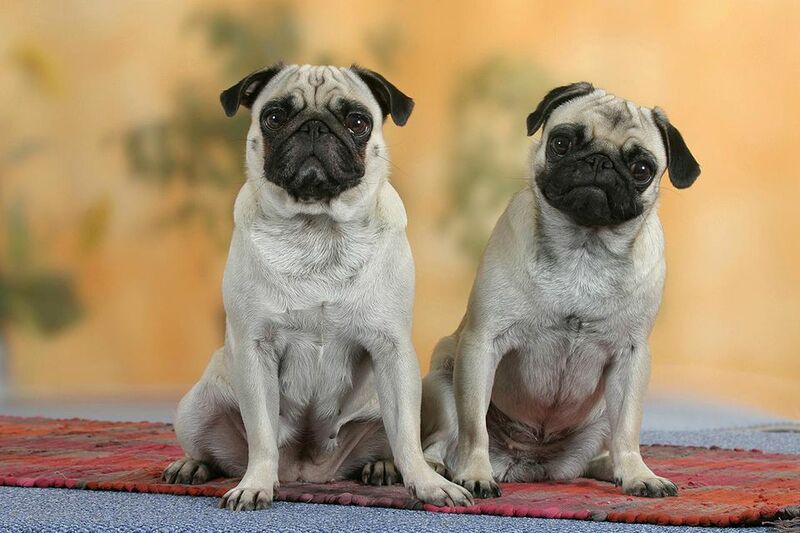 They contributed shorter legs and the modern style of pug nose to the breed. The pug was first registered with the American Kennel Club (AKC) in 1885 and has continued to gain popularity. The pug has a short, soft hair coat with a tendency to shed. Basic routine grooming with regular brushing is generally sufficient for the breed. Extra attention should be placed upon keeping the pug's facial folds clean to prevent infections. Wipe out the debris with a damp sponge or baby wipe and then dry the area thoroughly. Frequent bathing may be recommended if your pug has any allergies or other skin issues. Pugs are happy dogs that often respond well to training (especially because they tend to be food motivated). At the very least, teach your pug basic commands and be sure to get him used to being handled. Pugs often have a stubborn side. Therefore, untrained pugs can be difficult to deal with in situations like handling for nail trims or paying attention to you when there are distractions. Trim the nails regularly to keep them short and comfortable for your pug. Pay attention to oral hygiene and brush your dog's teeth at least a couple of times each week to keep his gums and mouth healthy. Be aware that they often have dental problems with crowded teeth and may need more frequent dental cleanings at the veterinarian. Pugs have to burn off some energy and need a moderate amount of exercise. A nice walk and active play will be good for your pug. Be sure not to over-exercise your pug, especially in warmer weather. The pug's short muzzle makes it harder for this breed to cool down through panting. Pugs are prone to heat exhaustion and heat stroke, even in cooler temperatures. Be sure not to leave your pug unattended in a vehicle, even in cool weather. When traveling by air, it is best for a pug to travel with you in a carrier in the passenger compartment. They aren't known to be barkers but you will hear plenty of funny pug noises, including snoring and episodes of reverse sneezing. Their long history as companion dogs rather has contributed to the pug being friendly to all, but socialization is still an important part of raising a dog. Exposing your dog to other people, dogs, and small animals in a variety of situations will help the dog feel more confident and not shy, fearful, or aggressive. Pugs are a good choice for a family with children as they love kids and kids love them. They are small enough to play with kids but not so delicate that they are at risk of injury. It is always good to ensure children treat a dog with respect and don't handle the dog roughly. Pugs also are usually good with other dogs, cats, and other small animals. Pugs should be fed two meals a day of up to 1/2 cup of dry dog food at each meal. The amount needed will depend on the dog's size, activity level, age, and other factors. This will change throughout the lifespan of your dog. You will need to resist overindulging your pug and giving human food as a treat. Pugs love to eat and it is easy for them to become overweight or obese. This can reduce their life expectancy and contribute to the development of many health conditions. Be sure to monitor your pet's weight and discuss it with your veterinarian to get recommendations to keep your dog healthy. If you think the pug is right for you, be sure to do plenty of research before obtaining one. Talk to other pug owners, reputable breeders, and rescue groups to learn more. Explore more dog breed profiles to find the right dog to bring home.